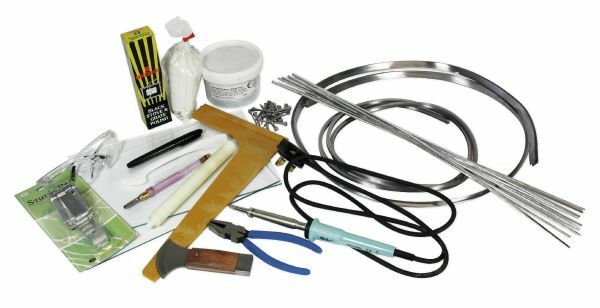 Stained Glass Starter Kit - With Weller 100W Soldering Iron. PLEASE NOTE: 100W Soldering Irons are currently out of stock and due in at the end of February. Please see induvidual product descriptions for more information about each item in the kit. Free Delivery plus Save 5% off the retail price! If you want to change an item on the list, e.g. upgrade your cutter, or choose a different book, please ask at the time of order and we will be happy to do so. We prefer the Weller 100w soldering iron as its thermostatic control reduces overheating (which can melt lead if not used with care), and it is less bulky than the professional size 200w iron.